Dear Mr Limandas. Just a short note to tell you that we have arrived back in the cold of the Swedish winter but that we are still basking in the memory of our trip – and especially of our stay at Koh Jum. The trip to Phuket via Bamboo Island and Phi Phi worked perfectly and we spent another week in the sun after waving goodbye to you. But after having visited Koh Jum even Bang Tao couldn’t be anything but a faint shadow of the true beauty we saw at your beach. Even though our kids were perhaps a little restless toward the end (!) Josefine and I enjoyed every moment of our stay at your wonderful lodge. Truly a beautiful place with an atmosphere and ambiance that just can’t be found anywhere else. As I write this I can’t help starting to plan another visit. Hopefully we’ll be back sooner rather than later. And perhaps I can trick my brother-in-law into coming with us and bring his kids to keep ours occupied. 🙂 Anyway – take care of your little paradise. I’m sure we’ll meet again. Best regards. Frederik, Josefine & Klara, SWEDEN. Dear M Limandas, I just wanted to send you a mail and let you know how satisfied we were with our stay at Koh Jum Lodge ! We felt that we were really lucky that found exactly the kind of hotel that we were looking for, and adding the good service from you and your colleagues and the splendid cooking it was just complete ! I have stayed at so many hotels during my 20 years in the tourist business and I can assure you that this place is now in my top-10 priority list! After Koh Jum we went on to Koh Lanta and I have highly recommended Koh Jum Lodge to Lanta Diver, who is the largest diving firm at the island and also has one of the largest incoming travel agencies from Sweden. Koh Lanta is almost taken over by swedes who comes on holiday, stays for the whole winter or invests in private homes so it´s an interesting group that is increasing rapidly every year. There are now three swedish schools at the island and somewhere around 200-250 pupils – from only 10 pupils four years ago… Good Luck with your business, you will have no problem filling the hotel in the future. Please say hello to your beautiful. It was so nice meeting you both! Best regards. Dear Jean Michel. I hope that you and your wife are fine, we have finally arrived to Sweden again after a long flight from Bangkok. First of all I would like to congratulate you and your wife for having such a wonderful and lovely resort at Koh Jum, a lovely spot with wonderful staff and scenery. 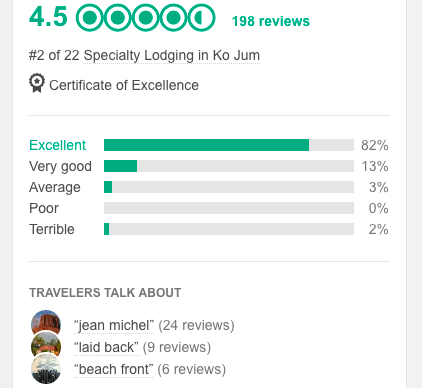 Jean Michel, your resort is the best memory of our trip to Thailand and you are a wonderful host as well as your wife and we will surely be back as soon as we can. Our best wishes to your family and a happy new and great 2008. Sincerely yours. Hi Jean and Jane! I visited you over a week ago with my family (from Finland). We stayed just one night. However, the time spent at Koh Jum Lodge was the best time of our holiday. You made us feel welcome, we experienced absolutely amazing warm friendliness and quality of service. I need to thank you for everything. I told about this amazing place to our guide and hopefully some finns show up there someday. I truly was an honour to visit Koh Jum Lodge and meet you in person. Have a merry Christmas and happy new year! Hi Jean Michel! Just a quick word to say how very much we enjoyed our stay. It will linger with us for a long time to come. Hopefully we can return in sooner rather than later. We are slowly getting back into the swing of things at home. At least we don’t have to return to bleak winter streets or cold weather. The Cairns environment is very like Koh Jum in some ways. Blue skys, warm weather, and coconut palm fringed beaches with rainforest covered hills behind us. Thank you once again for a lovely stay. Au revoir. Trish and Geoff, The Cairns. Dear Jane and Jean-Michel. 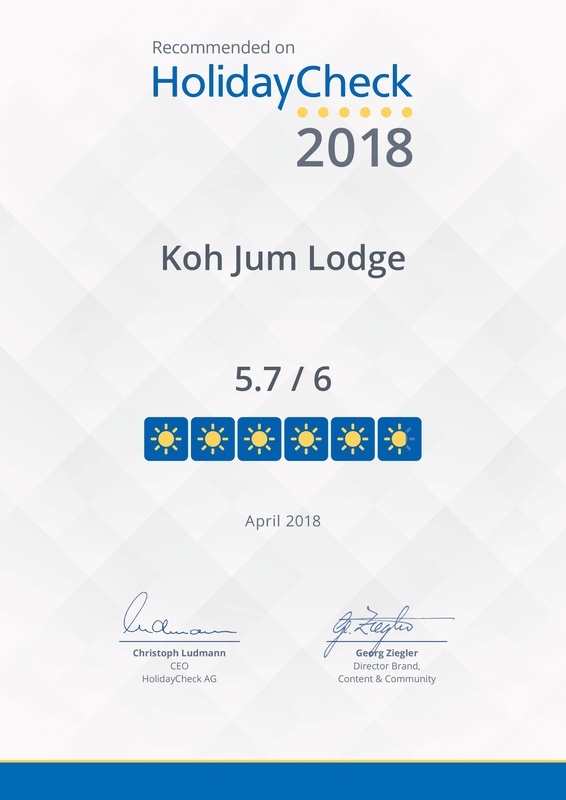 We have now been home for one month and got used to cold, snow and rain, but some memories are coming up frequently: the nine days at Koh Jum Lodge was an unique experience and one of the best vacations in Thailand. Hopefully Koh Jum will stay the way it is now for many years ahead and not get destroyed by too many tourists. Nevertheless we tell our family and friends, if they want to experience an adventure and to relax in Thailand, then go to Koh Jum Lodge. Thank you for your hospitality and please give our regards to your excellent staff and the dogs. We hope to be back some day. Best regards from Rolf and Bodil Johansson. Jean-Michel. 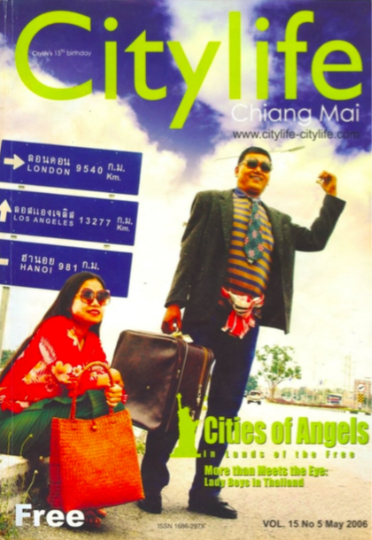 Cindy and I are now back in London after a fantastic 3 week holiday in Thailand…. it is cold, grey and wet wet wet!! I just wanted to write to thank you and your fantastic staff for a wonderful 3 days at Koh Jum Lodge, it turned out to be the highlight of our holiday! There were so many fantastic, often little, but significant touches of luxury to our stay with you. Things like the delicious welcome drink, fresh flowers in the bowls to rinse or feet before entering the lodge and the super comfortable hammocks… Your restaurant is simply superb and the way you talked us through the menu, describing what was fresh each evening demonstrated your passion for food and entertaining, the fish starters (we had Barracuda Carpaccio and Mackerel Japanese style) were especially tasty and the Tom Yam Soup that I had one evening was my best meal whilst in Thailand. We also especially enjoyed the ‘unscheduled’ daily excitements like when we saw one of your staff climbing the coconut tree to harvest them so they didn’t fall on somebodies head… We were then offered a coconut straight off the tree to go with our breakfast, delicious! The resort really does have a marvellous family feel to it, your staff are so attentive and keen to learn, ‘Pirate’ marches around with such deserved arrogance and you are never far away should anything go amiss! Koh Jum is a fantastic little island and I hope electricity and paved roads are never introduced so that it stays this way. I can say with some certainty that we will be back to visit you again, perhaps not next year, but return we shall! Please pass on our fondest regards to your wife (whom I was sorry not to have met), to all the staff and of course to ‘Pirate and friends’! Rustic huts from 100 B per night exist, but it’s been 23 years since our backpacking days, so we opt for a little luxury at Koh Jum Lodge where 16 Andaman style bungalows nestle into perfectly manicured tropical gardens. Hosts Jean-Michel Limandas, from France, and his Thai wife Jane Suraswadee Sanongkul, bring the best of an east meets west lifestyle to their cherished resort including a menu of Thai and Mediterranean dishes, fine wines and exotic cocktails. The library touts hammock mates in several languages, ranging from Eastern history to pop fiction. With 40 years combined background in the tourism industry, Jean and Jane set their standards according to a demand for “small capacity resorts with natural, individual charm, high level of services, in a rare unspoiled environment.” According to guest, Sharon Pearson of Canada, Jean-Michel and Jane have met their mark. “We’ve stayed at several of the world’s top hideaways as recommended by Conde Nast Magazines, Koh Jum Lodge definitely fits into that category.” The Robinson Crusoe meets Martha Stewart hideaways, bamboo, teak and cotton underscore iridescent organza sheers dancing in the sea breeze, a transparent blue washbasin and quirky stainless steel fixtures. With a loft for the kids, a chaise lounge and a king size bed with perfect pillows; it takes the promise of a fine meal to entice you out. Mrs Julie, Chiang Mai City - THAILAND. Hi Jean Michel. I Wanted to send you this photo and tell you again how much we enjoyed our stay at Koh Jum. As I suspected when we left, our stay with you was the highlight of our 7 week trip. Thanks again and we hope to see you again. 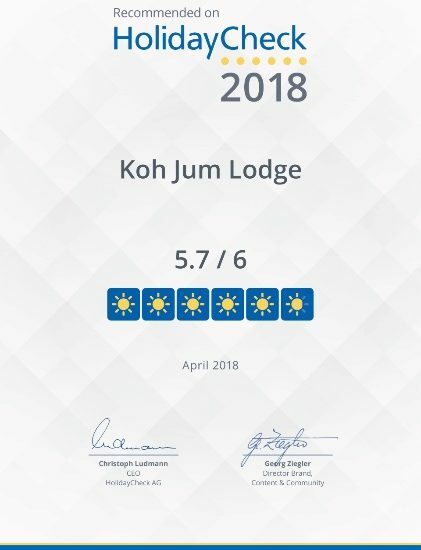 We will highly recommend the Koh Jum Lodge to all of our friends who visit Thailand. With warmest regards, Bruce, Carol, William, and Nicholas. There are many more excellent reviews that you can read on TripAdvisor.